MIIEGO SPAIN | MIIEGO® AL3+ EXCLUSIVE EDITION LAUNCHED! MIIEGO® AL3+ EXCLUSIVE EDITION LAUNCHED! MIIEGO® has just launched EXCLUSIVE EDITION of our popular and multiple award-winning model AL3+ in the colors ROSE GOLD, SILVER and GOLD. 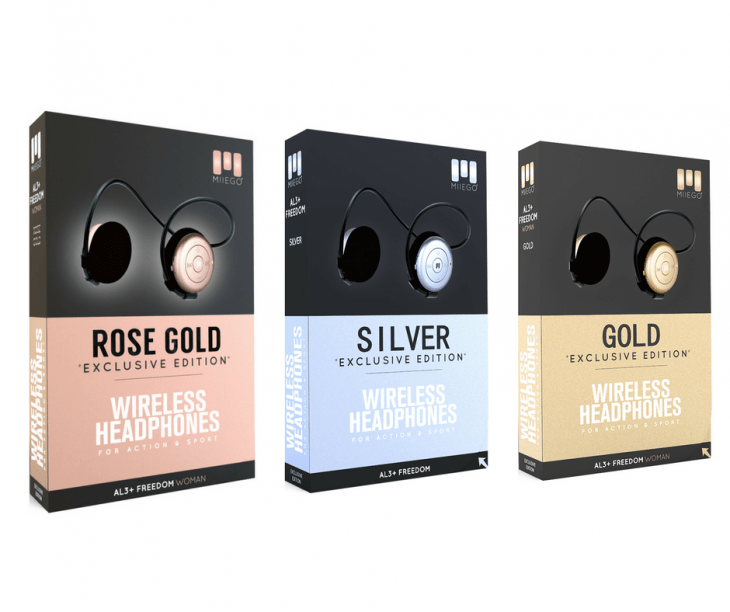 The Exclusive models of course have the same ultra-secure and comfortable fit that you know and 11 hours of long lasting battery life combined with great sound quality. AL3+ ROSE GOLD and GOLD are designed like AL3+ Woman with a shorter neckband that fits medium and smaller size heads, whereas AL3+ SILVER is like AL3+ FREEDOM and fits medium and large size heads. The Exclusive Edition is sold through selected retailers, resp. on selected markets (GOLD) only! If you have questions regarding availability of the Exclusive Edition in your country please do not hesitate to contact us at info@miiego.com. We will guide you to your nearest retailer selling the AL3+ Exclusive Edition. The Exclusive Edition is limited – go and grab your exclusive pair of AL3+ today! Lunes a viernes 08:00 – 16:00 (CET). Conviértete en parte de miiego.